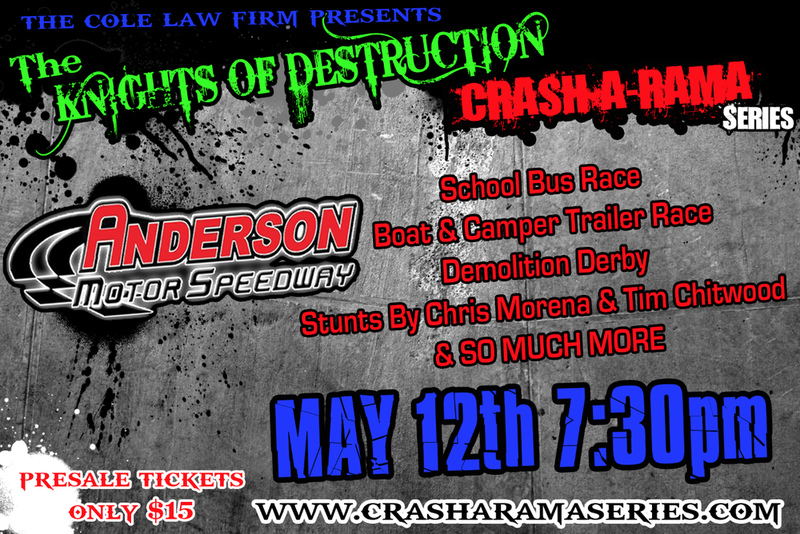 The Crash-A-Rama Series Returns to Anderson Motor Speedway! Saturday May 12th 2012 is just another Saturday right? WRONG! May 12th 2012 will be remembered as Destruction Day in South Carolina, but do you know why? Because The CRASH-A-RAMA Series is back! Last year the CRASH-A-RAMA Series blew fans away with their wild, insane and intense races. Fans were treated to an out of control skicar race, a chaotic boat & camper trailer race, and a hard-hitting ground shaking demolition derby. Expect to see those and a whole lot more this year, because they are not holding back. Last year the series put on a great show that broke attendance records at the track and this year is going to be even bigger. Expect to see an amazing school bus race, two demolition derbies, skicar racing, and the fan favorite boat & camper trailer race and so much more. All of this excitement will leave you at the edge of your seat wanting more and more! Visit www.CRASHARAMASeries.com for more information!